Our work on multiscale shape skeletons was funded by the NWO-EW project MULTISKEL (2005-2009). Our work on software evolution was partially funded by the SenterNovem project ITEA Space4U. Our work on areas of interest was partially funded by the SenterNovem project ITEA Trust4All. Our work on visual analytics was partially funded by the EU coordinated action project VISMASTER. 'Program traces' represent massive sets of events recording the dynamic behavior of software. Analyzing traces reveals many important patterns, such as performance, security, or correctness problems. ease of use: trace-comparison results can be visually and interactively examined and queried, allowing users to pose/refine questions at various levels of detail. The image below illustrates the main features of our TraceDiff tool. Users can select two or more traces to compare (left window); next, time-ranges of significant execution differences are automatically highlighted (overview); selecting such a range shows a multiscale comparison of the two traces executions in the main comparison window. To compare traces, we developed an extended correspondence-based bundling algorithm, that is able to show both coarse-scale correspondences (matches) but also fine-scale matches in context. Our algorithm uses an extension of the classical shaded tubes? method we developed earlier for multiscale compound-graph visualization. The figure below illustrates our design. Atop of correspondences, several metrics can be mapped by color-coding, e.g. similarity or temporal order. This allows easily identifying outliers in near-similar trace sequences, as shown in the figure below. We used our TraceDiff tool to find execution-trace differences for software systems ranging up to over 1M lines-of-code and 1K function calls. For instance, running such a system with similar inputs, and next finding trace differences, allowed us spotting anomalous execution divergences which, in the end, indicate program problems (bugs or suboptimal code). 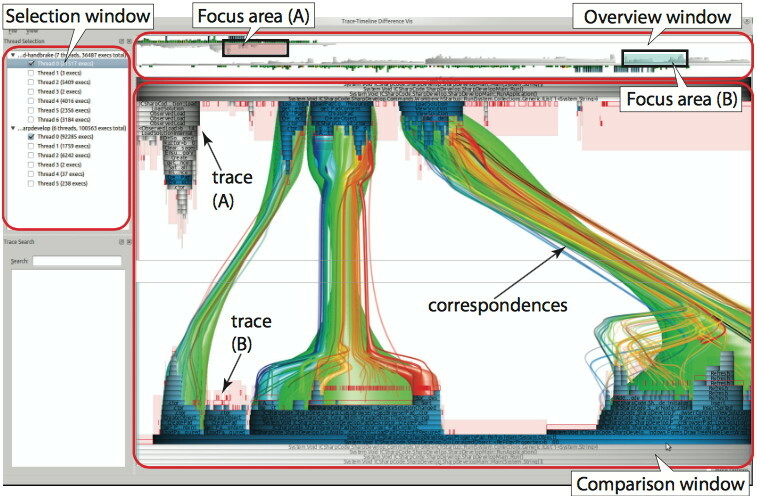 The figure below shows a snapshot from such a large-program trace comparison. Color encodes function call moments. Shifts in the blue-to-red color gradient indicate permutations in the function-call order, which in turn indicate execution problems. See our ICPC 2013 publication available here. 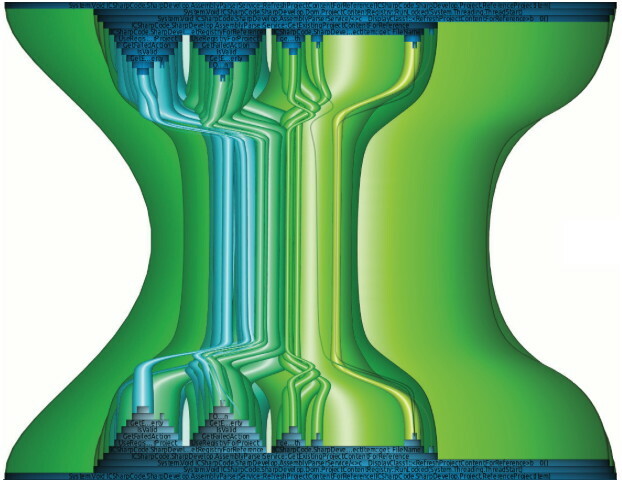 This work was done in collaboration with Jonas Trümper and prof. Jürgen Döllner (Computer Graphics Group, HPI, University of Potsdam, Germany). The TraceDiff correspondence algorithm is further maintained and used by the SoftwareDiagnostics company. For more details on ViewFusion, please contact its main developer and maintainer, Jonas Trümper. 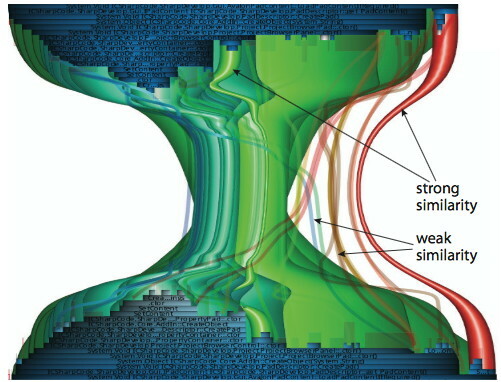 See also the talk on multiscale visualization of A. Telea delivered at HPI, Potsdam, Germany, in Feb. 2012.